Now, in the late stage of the campaign, presidential candidates are doing some traditional marketing -- increasing spending with a greater share going toward local TV versus national TV. Since September 25, Clinton has spent 71.6% of her ad budget on local ads -- $45.3 million -- and 28.4% on national TV -- $18 million -- according to an iQ Media report. Similarly, Trump has spent the majority in local TV versus national TV: 85% on local -- $64.5 million; 15% on national TV -- $11.5 million. Trump, who did not spend much TV money earlier in the year, ramped up spending in a big way in October -- averaging $2.5 million in daily ad spend by October 12. During the month, Clinton’s ad spending reached $1.4 million per day. But Clinton’s local TV spending soared October 29-30 through November 2 -- at one point, to over $7.5 million. Trump’s local spending was $3.5 million. National TV also began to climbing rapidly by comparison to lower national TV spending earlier. For the first two days of November, Clinton was just over $2 million, while Trump’s total came to $1.25 million. 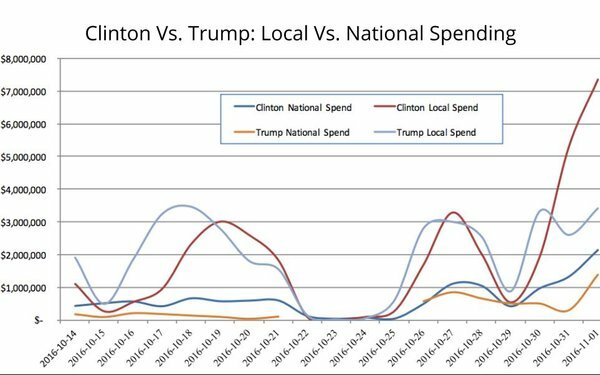 Clinton has been relatively more consistent in her spending during the month than Trump. Her biggest daily ad spends have been in Philadelphia ($320,000); Cleveland ($200,000) and Miami-Fort Lauderdale ($235,000). Trump ramped up heavily in markets from October 9 through October 14. His largest daily ad spends were in Cleveland ($2.7 million), New York ($2.6 million); Denver ($2.4 million); Philadelphia ($2.0 million); and Los Angeles ($1.5 million).